The 'Greater Toronto Area' covers a large area around Lake Ontario from Pickering through Oshawa, Toronto, Mississauga, Oakville, Burlington, Hamilton, St.Catherines to Niagara falls. While there are some spaces left in between some areas, they are slowly being filled in with buildings. Industrial along the highways, residential in between. 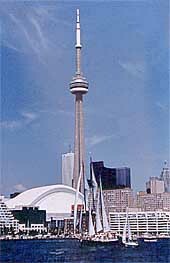 Toronto is in the Province of Ontario, in Canada. Canada is a Federal Parliamentary Democracy and an Independent Constitutional Monarchy, with its own elected government. Head of Government is an elected Prime Minister. Head of State is Queen Elizabeth, who is also Queen of England. She is represented in Canada by the Governor General. Canada is part of the British Commonwealth of Nations which is an association of sovereign states. The Canadian Constitution guarantees the Canadian Charter of Rights and Freedoms. Interested in placing your link of ad here? Design & © 2004-2011 Total Design Creations. All Rights Reserved.